The interrelationships between society and technology run deep. We all partake and participate in the unfolding technology evolution “discussion” that is our lives. The tools we use, try out, improvise, critique, and/or advocate are our minimal contributions to this discussion. The accidents of technological history set the context for the discussion. We are all technologists entangled in a technological world! Technology has been the main (perhaps the only?) means by which human progress has been achieved with tools like the pencil, slide fastener (or zipper), jet airplane, water systems, skyscrapers, bridges, and computers all dramatically changing society. Henry Petroski’s great short book “Invention by Design: How Engineers Get from Thought to Thing” explores the design and engineering arts in the full richness of their social context in nine intriguing case studies. 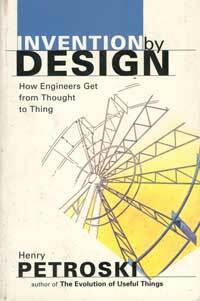 I first read Invention by Design in February 1999. Recently I was re-reading it when Michael Tweed of the The Ben Franklin Thinking Society invited me to lead the group’s Science & Technology meetup every month. That led to the Discussion: Engineering Failures & Society on 8 May 2011. Here are some thoughts reflecting on Petroski’s book, the 8 May meetup, and further cogitating about the big picture of society and technology. Hopefully these notes and your feedback will help us better understand the technological world at the core of our ever changing civilization. By taking Petroski’s “networks, systems, and infrastructures” to the next level of “design integrities” and identifying it as technology, Bucky leads us to the biggest of big pictures: Universe itself! As social creatures we often think of society as the big picture. I think his point is well made: technology is an inhernet component of Universe itself. Human society is our storied Earth-developed technology. It seems likely that Human society will become the “brain” managing the regenerative ecological functions of Gaia, the theory that Earth is “alive”. If that happens, the storied technology of Earth would probably become even more syntropic and powerful than what life has achieved thus far. Regardless, society and the technology with which it is built are inextricably intertwined!